ROME (ITALY), Friday, January 11, 2019 (MERCURPRESS.COM) - Author of very accurate and appreciated studies on the history of the Trade Unions , Agostino Portanova is certainly a non-conformist and "politically correct" writer. Portanova is the author of three volumes, now collected in a trilogy, which together provide a cross-section of the true Italian history, from the so-called " prima repubblica " to today, often passing through the facts - enormous for importance and relevance - that have seen his land, Sicily, as the protagonist in the international geopolitical scenario. This trilogy may be summarised in three parts: Politics and trade unions in Sicily from 1944 to 1970, domestic terrorism of the 70's, the 80's the end of the first republic with Tangentopoli scandal and the first Berlusconi govern. A genuine mosaic, the one composed of (real) stories that go through those years that Portanova has proposed himself to examine, exploiting and verifying a huge amount of records, documents, interviews and reinterpreting them in an organic way, taking into account an overall story of Italian society that certainly interacts, in the complex roots of international geopolitics. 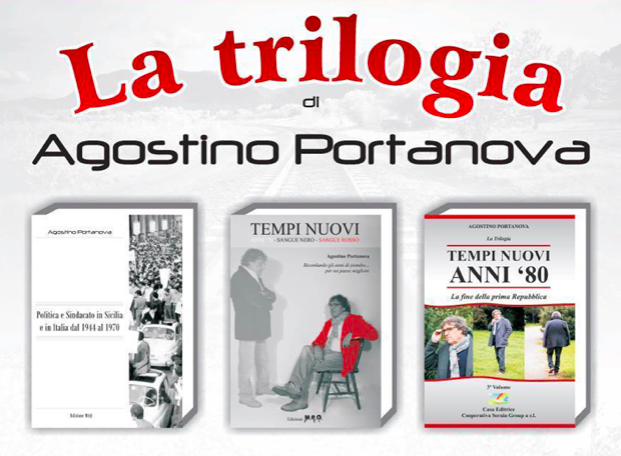 Agostino Portanova's civil and cultural passion and the personality that distinguishes him in action and reflection, are important and distinctive points, to which this trilogy with centrality and clarity, helps to uncover and clarify. Agostino Portanova has a degree in Political Science and from a young age has been involved in the social and political world. A trade union activist for over 20 years, he has acquired extensive knowledge of the history of the trade union. He was twice a municipal councillor in the Municipality of Palermo. Today he turns his attention of study and analysis towards the southern problems with a particular attention and commitment to the Green Economy.